The right office chair can dramatically improve productivity and work, just the same way as the wrong office chair can cripple efficiency and cause quite a bit of pain over time. 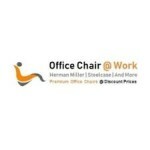 Office Chair @ Work is an online clearinghouse of sorts that showcases only the highest quality office chairs made from reputable manufacturers. They also happen to be one of the few authorized Herman Miller retailers on the internet as well. Visitors to the Office Chair @ Work website can shop by brand, by type, and by body type, giving them ample opportunity to choose the right office chair to improve their quality of life at work.